To start windows 8.1 or Win 10 in Safe Mode (Safe boot) please use the windows system configuration! and confirm that with [ENTER], or press the [OK] button. PS: Full path of msconfig.exe is "C:\Windows\System32\msconfig.exe"
1.) Windows 8.1/10 in Safe Mode. 1a.) Info about Windows 8.1 in Safe Mode. 2.) Normal-, Diagnostic-, Selective-, Startup in Windows-8.1. 2a.) Info: Normal-, Diagnostic-, Selective-, Startup in Windows-8.1. Hot-Tip: ► ... How to make in Windows 8 restart with recovery options? 1.) Windows 8 in Safe Mode (Safe boot). 1a.) Info about Windows 8 in Safe Mode (Safe boot). Safe boot: Minimal. On startup, opens the Windows graphical user interface (Windows Explorer) in safe mode running only critical system services. Networking is disabled. Safe boot: Alternate shell. On startup, opens the Windows command prompt in safe mode running only critical system services. Networking and the graphical user interface are disabled. Safe boot: Active Directory repair. On startup, opens the Windows graphical user interface in safe mode running critical system services and Active Directory. Safe boot: Network. On startup, opens the Windows graphical user interface in safe mode running only critical system services. Networking is enabled. No GUI boot. Does not display the Windows Welcome screen when starting. Boot log. Stores all information from the startup process in the file %SystemRoot% Ntbtlog.txt. Base video. On startup, opens the Windows graphical user interface in minimal VGA mode. This loads standard VGA drivers instead of display drivers specific to the video hardware on the computer. OS boot information. Shows driver names as drivers are being loaded during the startup process. Make all boot settings permanent. Doesn't track changes made in System Configuration. Options can be changed later using System Configuration, but must be changed manually. When this option is selected, you can't roll back your changes by selecting Normal startup on the General tab. 2. )Normal-, Diagnostic-, Selective-, Startup in Windows-8. (Image-2) Normal-, Diagnostic-, Selective-startup in Windows-8. 2a.) Info: Normal-, Diagnostic-, Selective-, Startup in Windows-8. Normal startup. Starts Windows in the usual manner. Use this mode to start Windows after you're done using the other two modes to troubleshoot the problem. Windows-8 - FAQ-66: How to start windows 8.1 / 10 in Safe Mode (Diagnostic-, Selective-, Normal- Startup)? Windows 8.1 / 10 automatically creates restore points when programs are installed, system changes, installing drivers, etc Content / Tip / Solution: 1. Window 8.1 Startup Selection Stuck on Selective startup? Is safe mpde diagmpstoc startup? How to change alternative safe mode to normal in windows 8? Stuck in windows 8 diagnostic startup screen? What is diagnostic startup windows 8? How to boot into dianostics on windows 8.1? Windows 8 selective boot with bios? Windows 8 switch to vga mode key combination? Windows 8.1 MSCONFIG reverts back to selective startup from normal startup? Boot to diagnostics windos 8? Normal startup for windows 8 in desktop? Win 8 diagnostic, How to get out of diagnostic startup? Windows 2012 stuck in alternative shell startup? How to make selective startup for sc2? Msconfig windows 8 make diagnostic startup permanent? How to stop windows 8 diagnostics from starting on boot? Windows 8 diagostis boot ergo Normal startup versus diagonistic startup? Boot windows 8 in normal startup? Windows 8 wont start, wants to do a pc diagnostic? How to enter safe mode in gui windows 8? Windows 8.1 start safe mode? Windows 8 normal startup or selective startup? Windows 8 and booting diagnostic? How to start windows 8 in normal mode? How to start win8 in safe mode? How to enter safe mode windows 8 on power on? Stuck in windows 8 alternative shell mode? Exit windows 8 safe mode Alternate shell? Wow to open windows 8.1 in diagnostic mode? To run network diagnostic restart the computer in normal mode? How to get out from selective mode? Msconfig will not start in normal? How to enter diagnose in Windows? How to start hp min on diagnostic screen? Pre boot diag to show on desktop? Start windows in diagnostics mdoe? How to turn diagnostic startup off without a window login? How to get out of diagnostic startup? Windows 10 no login after diagnostic startup? How to start a diagnostics at boot up? How to enter safe mode windows 10 x64? How to start in diagnostic mode windows 7 toshiba? Windows 8 start up diagnostics? How to boot into selective startup? Windows 10 won't boot. goes into diagnostic? Windows 10 dianostics boot, Diagnostic mode in bios? Diagnostic tool that shows startup and shutdown? To run network dianostic restart the computer in mormal mode? How to make window explorer active during booting? Windows 8 wrong screen resolution how to enter safe mode? Desktop keeps running diagnostic tool at start in win 8? Selective startup windows 8, diagnostic boot? Selective boot up with bios, Windows 8.1 misconfig diagnostic start up? Windows 8 password for safe mode? How to get out of active directory repair In windows 8? How to go to safe mode in windows 8? Lenovo t420 cannot be changed to normal startup in msconfig? Selective boot up with bios windows 8.1? Can you run diagnostics on windows 8 during reboot? Cannot set to normal startup in windows 8? How do I get in diagonistic mode on windows 8? Windows 8 MS Config Normal Startup? Windows 8 selective boot up with bios? Safe boot windows 8 and alternate shell? How to fix win 8 with comand prompet stuck on logo? Preboot diagnostics for windows 8.1? Get windows 8.1 to open in diagnsticmode? Win 8 will not stay on normal boot, goes back to selective boot? Windows 8 and Changed msconfig settings, now I can't enter Windows problems? Windows 8 make all boot settings permanent? How to change display settings to vga from windows 8 boot? Windows 8.1 Normal Startup cannot set startup to normal? Best windows 8 diagnostics, how to get boot in to diag on windows 8? Start windows normally on windows 8? Starting windows 8 in safe mode during boot? Start indows 8 in normal mode? Windows 8 safeboot drivers, how to get windows 8 to start in diagnostic mode? How to remove diagnostic startup windows 8? Windows 8 can t start diagnosis? Windows 8 system configuration diagnostic startup? Diagnostics start up windows 8? Windows 8 stuck in selective startup? Alternate for system diagnostics for windows8? Windows 8.1 msconfig selective startup command? 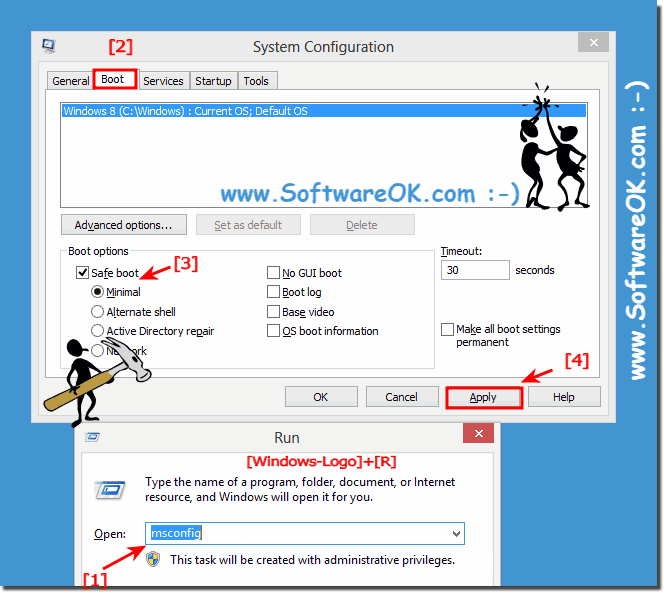 How to stop diagnostic mode in windows 8.1? Windows 8 safe boot active directory repair?